Work on Multi Storey Car Parks are generally extensive, and work will be a Combination of Top Deck waterproofing, and wearing course systems to the intermediate decks to afford protection whilst also providing an aesthetically pleasing and durable finish which are available in a range of colours. BS EN 1504 Part 2: Surface Protection Systems for concrete give “the basic requirements that designers need to specify, depending upon the structural analysis for both interior and exposed surfaces such as Car Park Decks. There are a number of systems that may be used depending on the particular project requirements. The products used may be based on an elastomeric coatings for use on exposed, intermediate and basement car park decks to provide Waterproofing and crack bridging accommodation, or fast cure MMA resin systems for use in fast track programmes and low temperatures conditions. Solvent free polyurethane systems are also used where fast track applications are required. In addition to the External and Internal deck waterproofing and surfacing, works will normally include: Remedial Concrete repairs, together with the application of Anti-Carbonation Coatings to both the internal and external concrete. Crack-bridging protection to the driving surfaces in accordance with BS 8110,will include bridging existing cracks, and cracks occurring after application, as well as accommodating dynamic crack movements due to traffic loading and temperature changes. Joint sealing of expansion joints will also be undertaken by the application of a liquid applied two component solvent free resin which will accommodate a wide range of movement gaps to accommodate movement in vertical, horizontal, transverse and longitudinal planes. Other Expansion Joint systems which can be used for Longitudinal areas on floor slabs and soffits , are surface mounted mechanical systems bolted to the structure and used to provide a flexible waterproof seal between adjacent structures that are not directly trafficked. Line marking for demarcation of parking bays and traffic flow are generally a cold applied reactive curing line marking system to provide the highest possible levels of retro-reflectivity available from a solid line during the day and night, and in the dry and wet. 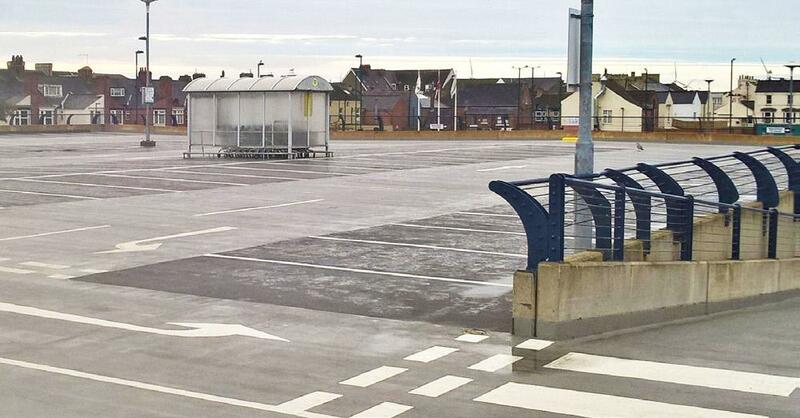 Refurbishment works may also include Decorative slip-resistant coloured surfacing for the demarcation of the parking bays and pedestrian areas. Easy to repair if damaged.